Details of the scandal engulfing the online fantasy sports company DraftKings should be common knowledge by now – A DraftKings employee admitted to the early release of data not generally available to the public and won US$350,000 on a rival site, FanDuel. The comparisons to insider trading quickly – and logically – followed. Questions abound that why a major player in the largely unregulated, multibillion-dollar (US$3.7B annually) fantasy sports industry didn’t have stronger controls in place to restrict access to protected information or ban its employees from participating in fantasy games elsewhere. ESPN initially announced it would end DraftKings’ sponsorship and later said it would stop its ads. A Kentucky man is seeking class-action status that accuses DraftKings and FanDuel of negligence, fraud, and false advertising. The lesson from this latest corporate blunder should be crystal clear: A well-designed system of internal controls is fundamental to reducing business risks. While DraftKings is not currently publicly traded, it is a textbook example of how limited or poorly designed internal controls can quickly be overwhelmed by the pressures of rapid business success. One of the criticisms of mandatory internal process and controls regime is that start-ups lack the resources to support them. But without such an investment, organizations are at greater risk of making much costlier mistakes in the future. I recently had a coaching conversation with a newly promoted leader who was feeling frustrated. Her team was not performing to the degree that she thought was needed, and she constantly felt like she had to step in and take the reins in order to keep project meetings on track and projects, themselves, successful. By the end of each day, it seemed she had little time to work at her own job, often finding she had to stay late to answer emails and follow up on her commitments. Her energy was spent and the frustration with her team depleted much of the joy she had for her job. Now we really had something to explore. Many times new leaders (and, at times, seasoned leaders, as well) get securely attached to their own ways of performing a job; their way is the right way because, as their personal experience demonstrates, it’s been those very skills and techniques that got them into the position they now hold; it’s because they did a great job. But here’s where leaders might get derailed. If they hold fast to what they know best, their expertise, they squander the opportunity to truly lead. Rooke and Torbert (2005) suggest that great leaders are not differentiated by their personality or management style, but rather their “action logics”—how they react (or act) when they step (or are pulled) out of their comfort zone. People, according to the model, fall into one of seven of these action logics, which include such groupings as achievers, experts, diplomats, strategists, and individualists.When we allow ourselves to step back, reflect, consider others’ perspectives or ways of doing a task, we ourselves grow to be more inclusive and relational in our leadership capacity. And, by doing so, we can also transform how our organization develops across teams by modeling the same behaviors and, by extension, enriching the environment for others to also develop. Rooke and Torbert (2005) further suggest that most of our working population rests within the action logic stage of “expert”—actually 38% of the working population—someone who may be well-suited as an individual contributor due to his or her technical expertise and, possibly, less suited to be the developmental leader needed to grow others. When leaders are willing to practice new habits of letting go, and allow their team members to try new things (and, perhaps, perform tasks that might not map directly to what they would have done), amazing and wonderful things happen – for both the leader and the team. In Rooke and Torbert’s (2005) “action logic” language, this behavior demonstrates a later stage of development called the “achiever” stage (30% of the population), which occurs when a leader expands her capacity to focus on team development and team goals, rather than on personal expertise and personal goals. As you might imagine, as adults expand their capacity to let go, step back, and enable others to take more responsibility, make more independent decisions, and deepen their capacity to “lead in place” (Wergin, 2007), this leadership growing pattern becomes more challenging; leaders must be able to enter into the unknown and trust others’ capacity to lead. This leadership development process enables teams the opportunity to step up and take the lead on projects, and to learn from both their successes and mistakes. The leader, in turn, gets to learn new ways of doing tasks and, by extension of the willingness to let go, deepens the loyalty and trust across the team. My client decided to give it a try to let go and see what would happen. She decided to let herself lead. What she noticed was enlightening! Her relationships with her team members became richer, their creativity soared, and they began to make decisions independently. She then gained more time to work on her own tasks, thinking and planning strategically (and was able to answer her emails in time to get home to her family at a reasonable hour). She grew as a leader and gained the respect of upper management as her team achieved results that exceeded expectations. A simple shift of thinking can make all the difference as we commit to growing ourselves as leaders and to growing our teams. Letting go of what we know andletting ourselves lead can be that simple shift. What possibilities to let go might you see within your leadership life? As Americans we spend the majority of our lives in a cubicle or office somewhere, working diligently as a cog in some giant machine. All so that we can afford essentials like housing, transportation, health care and food. Money continues to top the charts as the thing that brings us the most stress, and it’s no coincidence that our jobs come in a close second. For many of us, the biggest pain point on the job comes from the relationship we have with our boss. A boss that doesn’t know how to properly motivate, challenge and credit employees can have a overwhelmingly negative impact on their team. What’s worse, once employees start leaving reviews on sites like Glassdoor.com, the manager’s actions, or lack thereof, can have a truly adverse effect on the company’s brand and especially its ability to acquire new talent. After all, employees who are highly skilled have options, and rarely do anything just for the money. So why would they ever choose to work in a toxic environment? Now, when I use the terms “boss”, “supervisor” or “manager”, I’m referring to everyone from c-level executives to mailroom employees. There’s hardly an organization that doesn’t have at least one manager who turns their division into a petri dish of bad ideas. Typically it’s because they take advice from dopey management books, misapply lessons from stories of the lives of famous CEOs, or implement a surface level understanding of human psychology that they get from online magazines. I’ve manned cash registers, worked on research teams, have been a middle-manager, owned a small business with 6 employees, and directed a team of 30…so I know what it’s like to be a manager, and I’ve also dealt with many of them in a wide variety of situations. Those experiences, coupled with years listening to family, friends, colleagues and strangers rant about their bad bosses, have given me a rich perspective. Whether you’re actively searching for new employment, hiring managers for your company, or simply making a decision about whether to stay with the organization you’re in now – there’s one key indicator that signals that you may be dealing with a manager from hell. Some of the most inept and unsuccessful managers I’ve known have seen failure as a curse word, a proverbial third rail that should never be touched or crossed. Some even went so far as to change the definition of success midway through a project to avoid failure. From the outside, or perhaps from first-hand experience, you might empathize with their situation. You might see it as a manager protecting their team or company from the barbarians at the gate. After all, failures such as missing goals can depress stock prices or ruin a company all together. Isn’t the fear of failure a good thing? Simply put, no. As noble as a manager’s intentions might appear, the fear of failure is a perfect recipe for mediocrity and obsolesce. Thomas Edison cut to the heart of the matter when he said, “I have not failed, I’ve just found 10,000 ways that won’t work.” Whether it’s testing drugs that cure diseases or figuring out how to launch and land reusable rockets on Mars, failure is a vital part of the equation. It’s just as important to know how to do a thing, as it is how not to do a thing. I’m not suggesting that managers who wear failure as a badge of honor should be celebrated. What I’m saying is that managers who are willing to take risks to reap big rewards are invaluable to both the company as well as the team they manage. How a manager views failure is important, because that mindset carries with it a slew of other valuable character traits. When your boss can appreciate failure’s place in the workplace, you can expectnot to be thrown under the bus every time they need to account for a failure. You’ll likely have the opportunity to learn new skills and gain a great deal of autonomy at your workplace, since you’ll no longer be mired in BS and trying to maintain the status quo. You might even be given credit for your successes…imagine that. Most importantly, you will find purpose in the work you do, while simultaneously building a stellar resumé for any future pursuits. However , if you’re in a situation where your manager acts like the one in the Dilbert cartoon below, your best option is to simply leave. Sure, there are circumstances where getting a different job isn’t feasible, but more often than not, that’s just something we tell ourselves so that we don’t have to deal with the uncomfortable reality of change. This will take time, so set a realistic hard date for your exit once you’ve figured out how much time you need to acquire new skills and showcase current ones. This is of utmost importance, because it will solidify your plan in your own mind and make it more real. And, of course, don’t be afraid to fail. Just remember to document and learn. I came across this brief slide – I didn’t hear the presentation first hand but the topic itself prompted a great deal of thinking and reflection upon a valuable lesson I learnt recently. Recently I had a short spell in a tech company that had experienced huge growth and doing fantastically well in recent years. It deliberately maintains a startup mentality but has an aspiration to be more mature in its corporate governance aspects – processes, controls, compliance and risk management. Enter me to the stage – I signed up to a role in a tiny risk management and audit team and saw a great deal of opportunities in implementing risk management from ground up in a greenfield environment. Without going into much details, building a risk management framework is no mean feat – it entails tangible deliverables such as risk process, appetite, reporting, roles and responsibilities and ongoing compliance and maintenance. An effective risk management framework also includes a crucial soft element – risk aware culture that permeates through the organisation so people consciously talk about risk and weave risks into their daily business conversation. Typically and conveniently, implementing the tangible stuff is the way to go. Usually backed by senior management or compliance regulatory requirements, certain things must be in place to discharge senior management and the board responsibilities. However, without the soft culture environment, many of these processes, reports and tasks remain a paper exercise or deliver limited business values. That’s one of the reasons that risk management sometimes is still perceived as functional support team and struggles to win a seat in the high level decision making round table (again another hefty topic). Now back to my experience. Within the first 3 weeks, I had drafted a risk management maturity roadmap with strategic and tactical plan items – the tangible and soft elements. I managed to obtain an in-principle endorsement of it without an agreement on exactly what is to be done. I was then tasked with a number of incumbent ‘risk/audit’ projects – some must-dos and some operationally-focused topics that one would say that wasn’t derived from a risk-based planning (that’s a different topic). The only piece of risk-focused project was business continuity implementation, which deals with disruption and availability risks. I sought to leverage on this project to firstly get to quickly understand the most critical parts of the business and secondly, promote risk management as a school of thought and get to people’s mind about its importance and value adding capability. I conducted informal and formal interviews and workshops, always started the conversation with an introduction of who risk management team is – what we do, how we do it and what value we can add, before launching into a tangible risk topic that was business continuity. It was a rather exhilarating experience as I put risk ‘on the map’ – interviewing 50 plus mid and senior managers in a space of 2 months. I was not Messi in risk management, but I was battling hard and much of time I was battling alone. I had the passion and desire in abundance and hoped hard work and persistence would overcome every challenge. I was working 10-12 hours a day in the office plus some hours at nights. Time flew by but I felt I was in the zone and making solid progress. In hindsight, I neglected an important thing to do. To put it in an analogy – I was a charged up and prepared warrior, carrying my swords and jumped right into the battlefield, with my fists clenched and eyes on the target, I fought a hard battle and importantly I made advances according to my war plan, I was hitting milestones. However, I forgot to stop in between battles and turn around and to communicate to my fellow warriors, to report on wins, losses and problems, to ask for reinforcement, to ask for advice, to tell them where I am going and most crucially why I am going that way and doing that thing. Well that’s a bit of exaggeration, I did, but not enough. I lost sight in my own backyard. Especially when you are new to a company, what I did was doomed to fail – the odds were against me, I was going to fight to my death – either being recognised as a warrior that stupidly took up an unwinnable fight on my own and lost, or most likely I would be seen as someone who didn’t plan well, misjudged the problem, failed to come up with the right solution, failed to see negative obstacles, failed to communicate and most importantly failed to deliver. I did fail by the way. I am no longer with this company. When I reflected upon this experience, I could easily blamed a million other things that didn’t go my way. But as I look hard at myself and striping it all down, I was leading a project of change management – changing the risk culture in this case. This project invariably has a lot of obstacles and resistance – people, entrenched mindset, existing way of work, selling the value – the stuff on the battleground. Launching into the battle with a crafted game plan (maturity roadmap), armed with a set of weapons (risk management experience and tools) and a determined mindset can only last you so long. My success also depended on team support, collaboration and communication. My battle was not lost on the battleground, but was lost in my war room and in my reinforcement and my support battalion. Like a game of football, Messi alone cannot win a game, he needs his team – a coordinated team, a team with shared belief and vision and a supportive team. I didn’t have it and I failed to build one before I went battling. 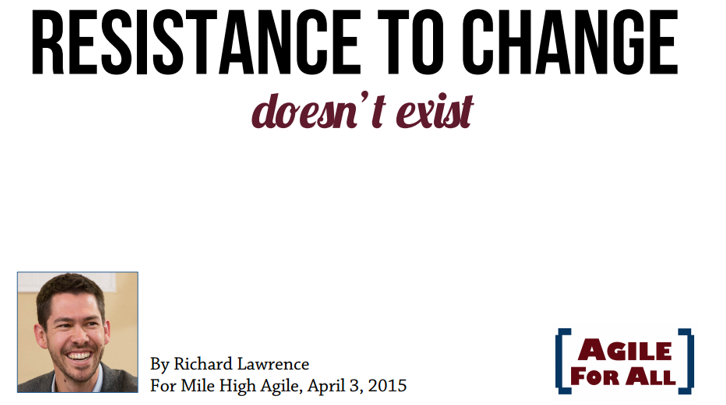 In any change management project in business or life, resistance is a false proposition – resistance to change doesn’t exist (well said Richard, even I don’t know you). In my case, the number one contributor to my failure that I had control of was ‘Communication’. A hard lesson to learn, but a valuable lesson learnt.